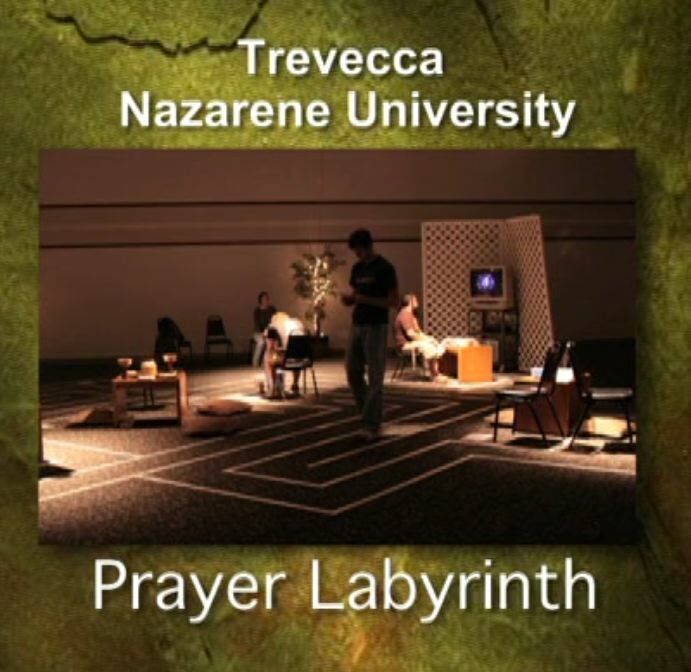 This is the prayer labyrinth at Trevecca Nazarene University. We put this photo of it here because the web page at the university’s website is gone. All references to the labyrinth and the photos are also gone. It was removed per order of Dr. Dan Boone, President of Trevecca, after several exchanges he and I had via email regarding the school’s promotion of contemplative spirituaity practices, including going on a retreat to the Abbey of Gethsemani in Kentucky. To our knowledge, the school has not renounced the use of the labyrinth, in spite of removing any references to it from their website. That is Dr. Boone’s explanation. my question is, what difference does it make? Your students are still doing it. I am waiting to hear from one of the local Nazarene Ministers who has expressed his desire to offer an opinion. When I receive his opinion, I will be writing (or hosting) an opionion editorial on the issue. Look for it on Richmond Evangelical Examiner. Thank you, Jim. Let us know when it’s out there. As a current Trevecca student, I just wanted to add that I, personally, greatly appreciate the Prayer Walk. For me, it provides a very needed chance to quiet myself with God and listen to His voice. Utilizing various things the Church has used for years (ie: lighting candles) reminds me of the great “cloud of witnesses” before us….there’s so much more to following Jesus than just this generation! I understand that you disagree with this, and that’s okay; you’re entitled to your opinion. But I just wanted to let you know that I really do find this practice to be drawing me closer to Christ. Thank you all for your concerns, and I pray that God will guide you just as He’s guiding me! I’m not looking for an argument, so I’m not going to post anymore, but I just wanted to let you guys know about the GREAT things that God is doing here at Trevecca. I won’t try to argue with you either. I appreciate your comments. All I ask is that you continue to prayerfully consider all that I have written here on this blog in the light of scripture only, and what the Lord commands us to do. The setup for the rift and slide into apostasy which Nazarenes are now fighting (or succombing to, depending on the degree of biblical illiteracy) was going on long ago. My studies at TNC (before the U) in the early to mid 80’s included general ed religion courses which focused on Moltmann, Tillich and Barth (liberalism and neo-orthodoxy, which relies on existentialism) — not as comparative, but as indoctrination — by at least one liberal professor. The chaplain who presided at the time introduced us to Richard Foster and “the disciplines” which would give us a higher experience. Tony Campolo was a special speaker at the time who did his famous cursing from the pulpit just to show us how hypocritical we were — right there in what used to be College Hill CotN. Honestly, while I did learn SOME great Biblical truths from some doctrinally-solid lectures; but the overall indoctrination into an experience-based, liberalism-tinged, spiritual formation mindset did a great deal damage to me for many years. I don’t blame the Nazarene church for MY faithlessness — but a Nazarene education, sure didn’t help. FCofN in Nashville has been under the teaching of a solid, Biblical teacher for years. That’s the only Nazarene church in my greater area I could ever recommend. I have now found solid teaching and a high respect for God’s word and the foundational Christian doctrines in LCMS. It’s not what you’re used to if you come from ANY evangelical church. But if you want law preached LAWFULLY and the Gospel for the repentance and forgiveness of sins in Christ ALONE, then I reccomend it for those who hunger to be fed God’s scripture alone. When first heard of these prayer labyrinths I was told they would be instructed to open their minds and to clear their thoughts,that I did have a problem with because that is a New Age thing. That is very dangerous it can allow demoninc influence you. I don’t have issue with a prayer room focusing on God’s word and prayer points. College student have many things pulling their attention off God that having a quiet area and directing them to meditate on the word of God. Maybe I missing the the apostasy. Could you explain? A prayer labyrinth has very recently made its way into my church. Needless to say i was stupified when I saw the enormous object laid out on the floor. Personally I think this a very simple thing to disqualify but not so easy for the practioners to see. Where should I begin? The Samaritan woman at the well with Jesus.. this exchange was on the surface about water but on a much deeper level it was about a false religious system and false system of worship that never satifies which the woman left behind signified by her leaving behind her cistern/waterpot. The emegent church is all about experiencing and encountering God, it is peddled like a drug and you need to come weekly to get your fix. We are supposed to encounter Christ once…as sinners, when we are convicted and quickened, which then leads confession and repentence then to acceptence of him. From that moment on we are forever in his presence (ps 139) how is it possible to encounter and experience God if we are already in presence this is an illogical concept. Any form of religion and/or any form of worship that is not based on Christ ALONE/the word, is a broken cistern and can never satisfy and will always require coming back (Jer 2). One need not look further that the men and woman that have penned books on contemplative prayer..foster, sweet, fox, compolo, young and merton to name a few and what they have expressed. they have all expressed their influences on contemplative prayer come from the eastern religions (zen, buddhism, yoga and even islam and others) and their master practictioners. They are very open about this fact and all willingly admit. The question should now be..because these people say Jesus does this make the act a christian one? Thomas Merton, who said he was impregnated with Sufism and wanted to “become as good a Buddhist”1 as he could be, believed that “God’s people” lacked one thing … mysticism and this is to what they needed “awakening.” Of Merton, Foster says: “Thomas Merton has perhaps done more than any other twentieth-century figure to make the life of prayer widely known and understood his interest in contemplation led him to investigate prayer forms in eastern religion Zen masters of Asia regard him as the preeminent authority on their kind of prayer in the United States .” (Spiritual Classics, P. 17) And yet, Thomas Merton once told New Age Episcopal priest Matthew Fox that he felt sorry for the hippies in the 60s who were dropping LSD because all they had to do was practice the mystical (contemplative) stream to achieve the same results. (Interview) We couldn’t agree with him more. Both Altered States are the same, and neither lead to God. I also want to give a word of precaution. In the silent contemplation of God we are entering deeply into the spiritual realm, and there is such a thing as supernatural guidance that is not divine guidance. While the Bible does not give us a lot of information on the nature of the spiritual world, we do know enough to recognize that there are various orders of spiritual beings, and some of them are definitely not in cooperation with God and his way! But for now I want to encourage you to learn and practice prayers of protection that all dark and evil spirits must know. I am willing to discuss this deeper and speak with and to anyone on the subject. The Word of God tells us that darkness and light are to have no fellowship with each other. NONE. Stay strong my fellow concerned Nazarenes and continue to fight the good fight…Contend for the faith!! !